For the Croquettes: Using a large stockpot, fill with water, place over high heat and bring to a boil. Once boiling, add the salmon fillet and blanch till cooked though, about 5 minutes. Drain in a colander and let cool. Once cool enough to handle, remove the salmon skim and place the salmon flesh into a medium mixing bowl. Add the cooked quinoa, garlic, egg, mayonnaise, cilantro, flour, lemon juice, salt and pepper. Using your hands or a rubber spatula, mix well to incorporate. Line a baking sheet with parchment paper and set aside. Using your hands, take about 3 tablespoons of the salmon-mixture and shape into a small rectangular cylinder and set on the prepared baking sheet. Repeat the above process with the remaining salmon mixture. Set aside. For the Coating: Place the bread crumbs in a small mixing bowl and the eggs in a separate one and place near your work station. Working one croquette at a time, gently dip the croquette into the egg to coat. Shake off any excess egg and coat in the bread crumbs, Place back on the baking sheet. Repeat the process till all the croquettes are coated. 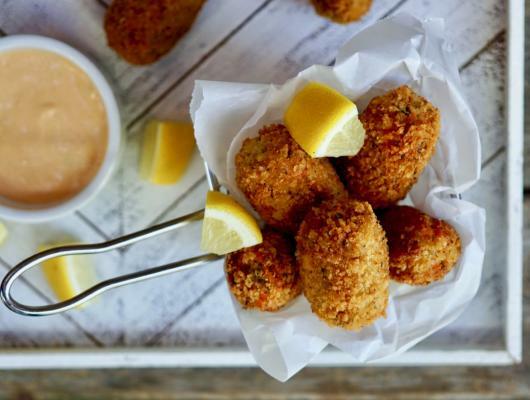 Place the croquettes in the refrigerator for about 20 minutes to set. Line a plate with some paper towel and set aside. Place a good amount of oil in a large saucepan and place over medium-high heat. When hot, but not smoking, working in batches, add a few croquettes to the pan being careful not to overcrowd the croquettes. Cook for about 2 minutes per side, until golden brown in color. Adjust the heat as needed so the croquettes are not cooking too quickly. Once evenly browned, place on the plate to drain. Repeat the above process until all the croquettes are cooked. 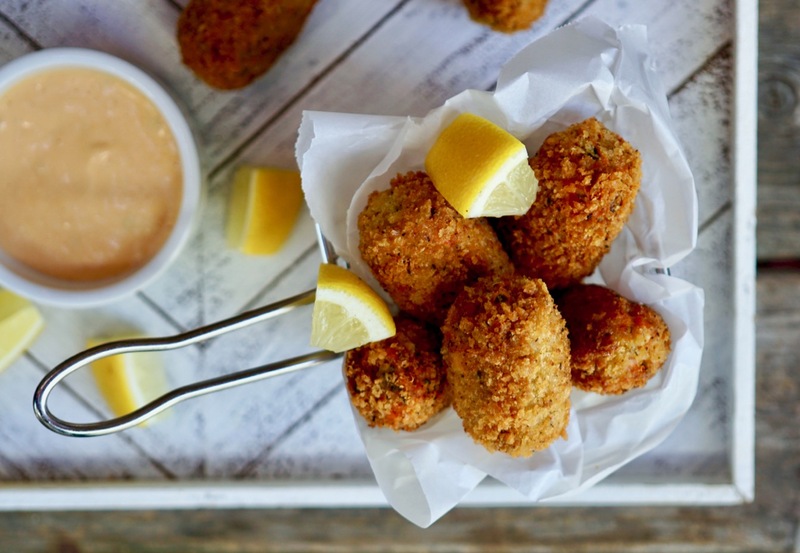 Serve the croquettes hot with lemon wedges and a dipping sauce of your choice.